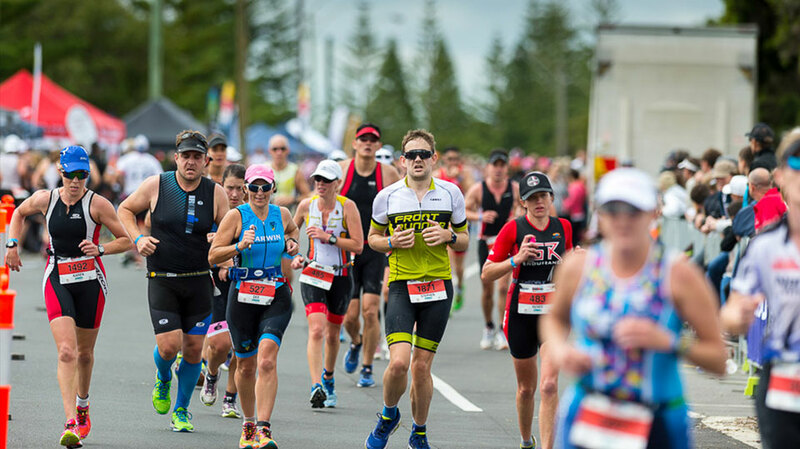 IRONMAN Asia-Pacific has over 30 years of experience delivering world class mass participation triathlon events and high profile endurance sport including cycling championships and marathons. The Aviva IRONMAN 70.3 Singapore triathlon was the last IRONMAN race to take place in Singapore three years ago. This is likely to change in the near future as IRONMAN Endurance Asia has decided to set up their headquarters in Singapore, with plans to bring IRONMAN events back to our island. So in the interim, isn't a good reason to start training for the IRONMAN challenge here? Can anyone take the giant step of committing to an IRONMAN triathlon? Ask Susan Lacke, a vegan runner/blogger who set out to prove she could do a triathlon just as easily as any muscle-bound dude. She refused to be intimidated, even when competitors made fun of her “No Meat Athlete” t-shirt. Train like you mean it. This doesn’t mean swimming a few laps, running a few miles and biking a few more a week or two before the event flags off. It means spending the months, weeks and days leading up to the big day being disciplined and faithful to conditioning routines that, when done properly, get you to the finish line. Eat your proper diet. Lacke may be a vegan, but the folks she competed against were mostly carnivores who stuck to their meat-based diets. That stated, this is certainly not the time to switch your standard diet! Wait until your first triathlon is history if the urge strikes to join the vegan crowd. 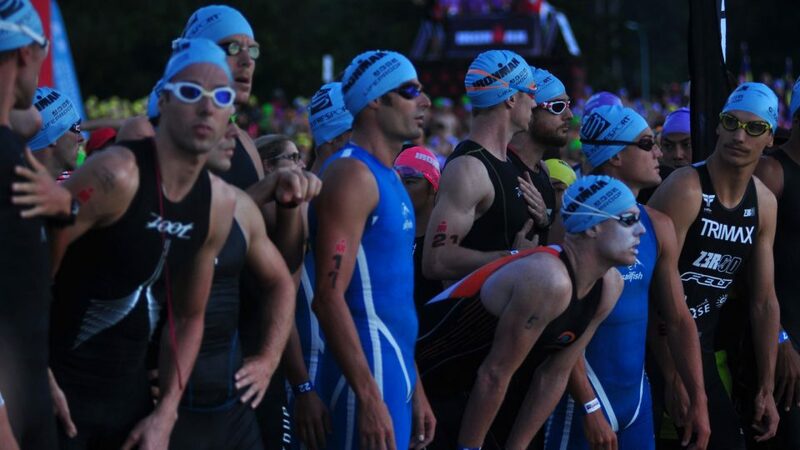 Compete conservatively at the beginning of your first IRONMAN. If you’ve been smart enough to put together a race plan that includes training through optimal times, performance peaks and rhythms, keep to your pace to conserve energy so you can pull out all stops near the end when it becomes necessary to push yourself hard. 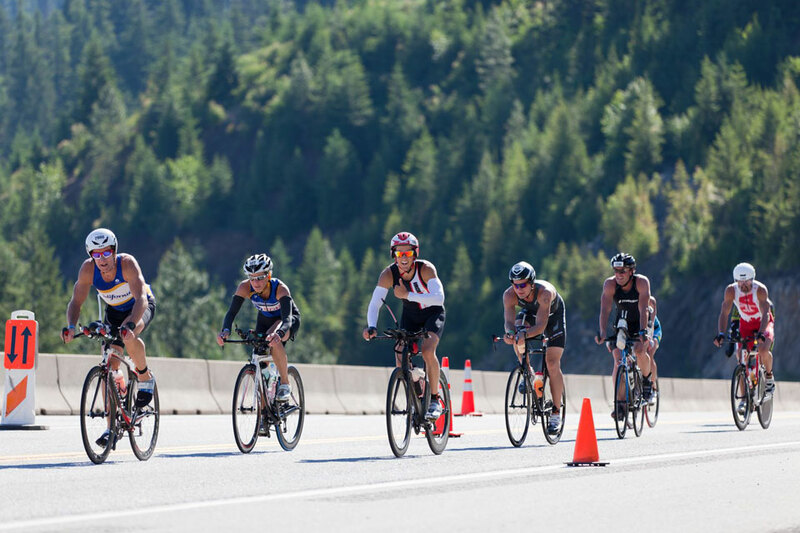 It’s okay to expect to hit “The Wall,” but just because you’re engaging in multiple sports during a triathlon that doesn’t mean your body isn’t going to have classic physiological reactions to the stress it experiences. Can you avoid the wall? Lacke did; she claims that anyone who trains properly can avoid it, too. Don’t ignore motivation. You need it. You want it. So ask for it: from your friends, family, work colleagues and yes, yourself. Savvy runners know that competitions are won as much in one’s head as on one’s feet and this is particularly true of a triathlon that tests every inch of your body and mind! You get bragging rights and fabulous stories to tell next time you’re in the company of those who have yet to face the most challenging of all types of sports endeavours. Forget what you've heard about triathletes — that they must be tall, young and strong. Triathlete blogger Joel Runyon claims he did a Triathlon with a 250-pound woman (age 40+), an 80-year-old man and a 6-year old child! He believes anyone can do a triathlon if they put their mind to it, so no excuses about your body type, please. 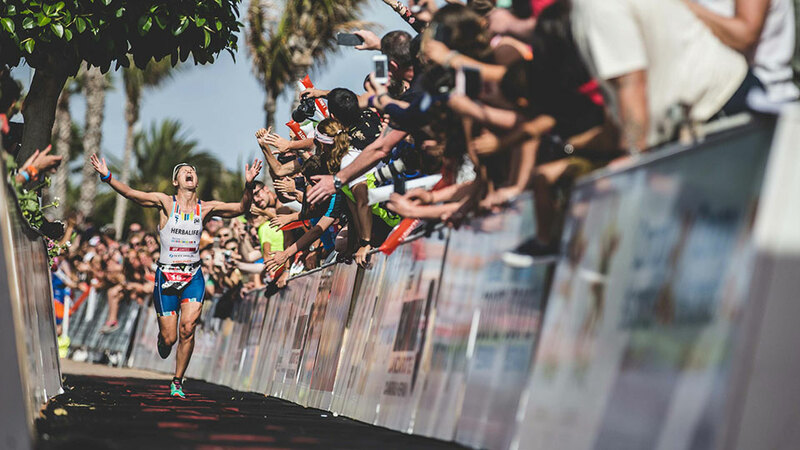 IRONMAN competitions are the most entertaining events of their kind because people who undertake them are simply fascinating. You’re going to laugh a lot (sometimes at yourself). That’s part of the fun. 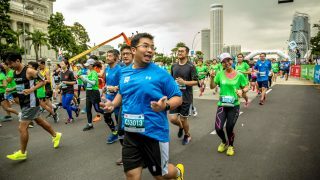 Of course you want to prove to yourself that you can stand up to the crazy switches from swimming to biking to running and do it all with aplomb. If you can’t challenge yourself, who can you challenge? Because you can. Simple enough? You just have to want to do it and the rest of the path that takes you to the finish line will follow. First, nothing beats a buddy if you’re going to train for an IRONMAN triathlon because a conditioning friend will help push you when you’re too weary to push yourself. 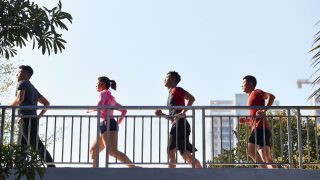 Also read: True Confessions of a Standard Chartered Marathon Singapore Drop-out! If you've got the resources, you can hire a coach to teach you and monitor your form, and because you pay them to make your life miserable, there's a better-than-average chance you will follow their advice and instructions to the letter. Time to take out your wallet. To be properly equipped for an IRONMAN, you are going to have to make sure you have the resources to undertake your training, which could mean spending some bucks. You'll need access to a pool, a racing bike and trails or track that aren't necessarily crowded with others. You’ll need different shoes for the running and biking legs. If you love performance enhancing gear, toys and electronics, you'd better keep your wallet open and your plastic available. 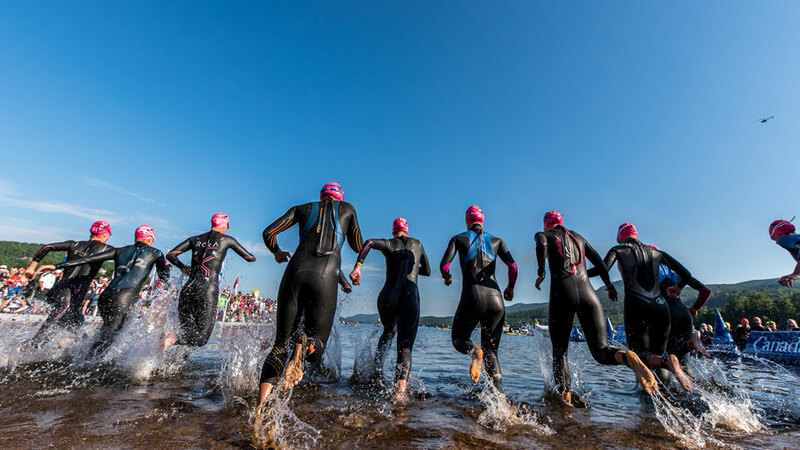 Experts say that the best stroke for a triathlete to master is the freestyle because it’s so efficient when competing in open water. But don’t do that exclusively when you train: add side-kicks, one-arm strokes and catch-up drills. Importantly, get your breathing in top shape. Aquatic trainers claim that newbies don’t rotate enough when they breathe, so do focus on that. Did you know that one of the best ways to train for IRONMAN swimming competitions is to use resistance bands? Just imitating arm strokes while keeping bands taut can tone those muscles, making them more responsive in the water. The rest of your conditioning should follow a running/biking pattern. Get yourself acclimated to gears. It’s the first step to mastering the bike when it’s to be used for a race. Become so familiar with your bicycle gears and brakes that you literally condition yourself to respond to the road without thinking too hard about your next move. Wear a helmet. As you grow accustomed to your stride, you don’t want to take chances. Here’s your guide to increased distances to prepare yourself for your first IRONMAN: Two runs per week for six weeks before the big day. Increase your run on one day from 2 miles to 4 miles, sprinting at a brisk clip. On the other running day, increase your speed from 4 miles to 7 miles, but at a more leisurely pace. Also read: A Nation Obsessed? 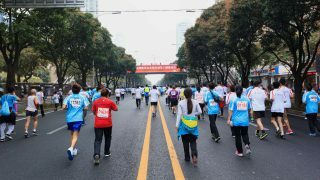 What is Happening to China's Marathon Scene? We won’t belabour this, but suffice to say that one rest and recovery day every week isn’t suggested; we insist upon it and you should, too. If your body and mind don’t get used to alternating sports on the fly, you won’t do as well as you might if part of your conditioning time is spent doing all three in concert. 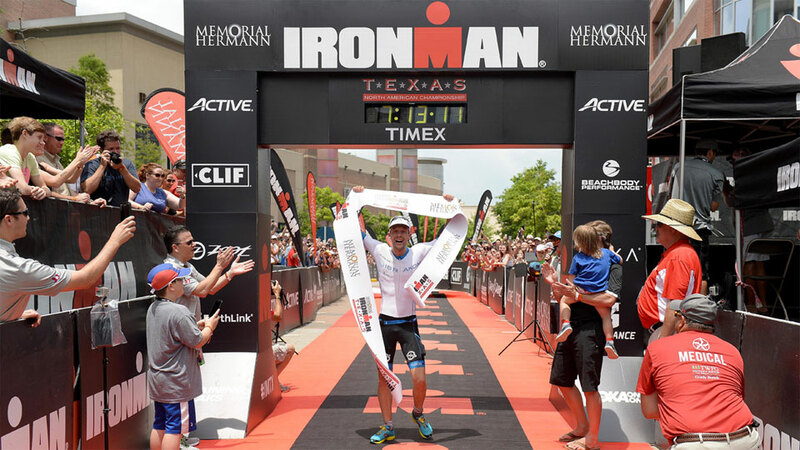 Too many triathletes think that all it takes is to stay on a 7-day schedule that includes the three individually, but in fact, it’s the process of switching up muscles on the fly that can make a triathlon champ. Show up early. Examine all three venues so you feel comfortable when transitioning between sports. Don’t be timid about asking “seasoned triathletes” for advice and tips. They’re usually happy to give it. Check your bike tyres; don’t let a task this simple trip you up. Tyres needing air won’t roll fast. Start the cycling portion of the IRONMAN in low gear and high cadence so your legs move smoothly into action. Jump in the pool. A warm-up swim can be relaxing and get you acclimated to the pool’s temperature. Stay at the back of your swim wave and let the alpha dogs go first so they don’t swim over you. Launch the running portion of your race using short, quick strides to conserve energy. Keep positive thoughts as you move through your events. If you have a mantra that inspires you, go for it. Have fun. Sound impossible? If your expectations are as simple as finishing, you won’t feel as much pressure, so having fun is entirely possible. Have we inspired you sufficiently to get you to make a commitment to taking part in a triathlon now that Singapore is the official home of IRONMAN?